Thermal processing remains the most important method of food preservation in use today, and the scale of the industry is immense. The large scale of these production operations makes it more important than ever that the process is performed perfectly every time: failure will lead to product deterioration and loss of sales at best, and at worst to serious illness or death. 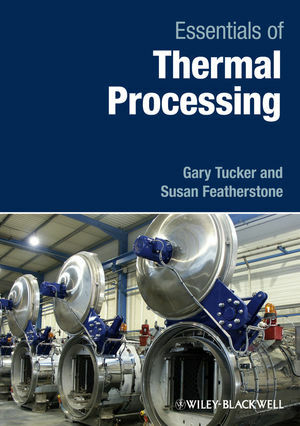 This volume is a definitive modern-day reference for all those involved in thermal processing. It covers all of the essential information regarding the preservation of food products by heat. It includes all types of food product, from those high in acid and given a mild heat process to the low-acid sterilised foods that require a full botulinum cook. Different chapters deal with the manufacturing steps from raw material microbiology, through various processing regimes, validation methods, packaging, incubation testing and spoilage incidents. The authors have extensive knowledge of heat preservation covering all parts of the world and represent organisations with formidable reputations in this field. This book is an essential resource for all scientists and technologists in the food manufacturing industry as well as researchers and students of food science and technology. 1 Microbiology of Heat Preserved Foods. 1.1 A brief history of the science and technology of thermal processing. 1.2.2.1 Growth and reproduction of bacteria. 1.3 Factors that affect the growth of microorganisms. 1.3.8 Oxygen content/concentration of gases in the environment. 1.4 Description of some microorganisms of importance to thermal processing. 1.4.3.2 Mesophiles – spore-forming bacteria. 1.4.3.3 Mesophiles – non-spore forming pathogenic and spoilage bacteria. 2 Hurdles to Microbial Growth. 2.1 Control of the microorganism loading. 2.2 Use of restrictive pH levels. 2.3 Anaerobic environment or modifi ed atmosphere environment. 2.5 Dehydration or low water activity. 3 Low Acid Canned Foods. 3.1 History of the canning industry. 3.2 Production of a thermally processed food. 4 Acid and High Acid Foods. 4.2 Thermal processing of fruit. 4.3.1 Oxidation reactions inside an internally plain can of acid fruit. 4.3.2 Pigments that discolour in internally plain cans. 4.4 Determining process recommendations for acid foods. 4.4.1 Calculation of pasteurisation values. 4.5 Inhibitory factors to microorganism growth. 4.5.1 High acid: pH < .8. 4.5.3 Medium acid: pH .2–4.5. 5.2 Acidity measurement using pH. 5.2.1 The history of pH. 5.3 The chemistry of pH. 5.7 Design of pasteurisation processes. 5.7.1 Medium acid range: pH .2–4.5. 5.7.2 Acid range: pH .8–4.2. 5.7.3 High acid range: pH below .8. 5.8 Critical control points in the production of acidified foods. 5.8.3 Post process equilibrated pH. 5.8.5 pH during product shelf-life. 6 Heat Preserved Chilled Foods. 6.1.1 Pathogenic microorganisms relevant to chilled foods. 6.1.2 Microorganisms likely to be found in chilled foods. 6.2.1 Thermal process step applied prior to packaging. 6.2.1.1 Low care–high care factories. 6.2.2 Thermal process step applied after packaging. 6.2.2.1 Caution with latent heat for frozen protein. 7.1 In-pack processing: Retort systems. 7.1.4 Water spray and cascade. 7.1.7 Reel & spiral retorts. 7.2 In-line processing: Heat exchangers. 7.2.2 Choice of heat exchanger. 8 Cook Values and Optimisation of Thermal Processes. 8.1 Mathematical analysis of cooking. 8.1.1 Cooking equations and kinetic data. 8.1.2 Competition between sterilization and cooking. 8.1.3 Optimisation of temperature/time in processing. 9 Measurement and Validation of Thermal Processes. 9.1 Setting the target process value. 9.2 Validation methods: Objectives and principles. 9.2.1 How to select the worst case conditions. 9.2.1.3 Retort or processing system. 9.3.2.1 Locating the product cold point. 9.3.2.2 Establishing the scheduled process time and temperature. 9.4.1 Temperature measurement systems for TD and HP testing. 9.4.2 Log reduction methods for HP testing. 10 Cooling and Water Treatment. 10.1.1 Chlorine demand and residual chlorine. 11.1 What constitutes a process deviation. 11.2 What can go wrong. 12 Packaging Options for Heat Preserved Foods. 12.1.2 Tin free steel (TFS or ECCS). 12.1.5 Internally plain (unlacquered) cans. 12.2 Can construction and handling. 12.2.2 Storage and handling of empty unused cans and ends. 12.2.3 Cleaning of empty unused cans. 12.2.4 Double seam formation and inspection procedures. 12.2.5 Washing of filled cans. 12.3.2 Closures for sealing glass food containers. 12.3.5.1 Inspection and preparation of containers. 12.4 Plastics, flexibles and laminates. 12.4.1 Advantages of retortable plastics. 12.4.2 Disadvantages of retortable plastics. 12.4.3 Polymers used for retortable packaging. 12.4.4 Types of packages used for thermally processed foods. 12.4.4.2 Plastic cans and pots. 12.4.5 Processing considerations – control of headspace. 13.1 Purpose of incubation tests. 13.3 Descriptive terms for canned food spoilage. 13.4 Methods for incubation testing. 13.4.2 Temperatures and times for incubation. 13.4.3 Post incubation inspection of containers. 14 Critical Factors in Thermal Processing. 14.2 Key aspects of hygiene control systems for food processing (from Codex Alimentarius). 14.3 Identifying critical control points in thermal processing. 14.3.1 Microbial load or bio-burden. 14.3.2 pH of the product. 14.3.5 Presence, concentration and types of preservatives. 14.3.8 Size and style of in-going ingredients. 14.3.9 Container, packing and filling considerations. 14.3.9.2 Container vacuum and exhausting of containers. 14.3.9.3 Container size and geometry. 14.3.9.4 Initial temperature of product. 14.3.10 Process related critical factors. 14.3.10.3 Type and characteristics of heat processing system. 15 Environmental Aspects of Thermal Processing. 15.1.1.1 Global warming potential (GWP). 15.2.1 Case study: Bottled apple juice. 15.2.1.1 Raw materials (0.407 kg CO2e/PU). 15.2.1.2 Manufacture (0.061 kg CO2e/PU). 15.2.1.3 Transportation (0.057 kg CO2e/PU). 15.2.1.4 Waste (0 kg CO2e/PU). 15.2.1.5 Overall carbon footprint (0.525 kg CO2e/PU). 15.2.1.6 GHG emissions for other food products. A colour plate section falls between pages 122 & 123.